We want to obtain a real time picture of how components of a multi-protein complex interact to perform complex regulated tasks, in particular to see how a protein system might be more than the sum of its components. In living organisms many proteins work in complexes to form multicomponent protein machines and to regulate cellular processes. The function of such multicomponent machines is usually addressed by dividing them into a collection of two state systems at equilibrium. Many molecular machines, like e.g. the heat shock protein Hsp90, work in large complexes with multiple states out of equilibrium by utilizing the energy of ATP hydrolysis. We use multi-color single molecule FRET to investigate the real time kinetics of multi-protein interactions using the example of the Hsp90 system, which consists of co-chaperones, clients and nucleotides. 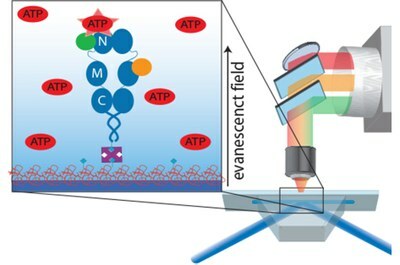 The fluorescence-based single molecule methods allow us to determine the succession of association and dissociation steps as well as large conformational changes simultaneously in real time. In addition, interacting interfaces can be determined by single pair fluorescence positioning systems. These studies impact the understanding of the Hsp90 machinery as well as general principles of multi-component protein systems, which is the basis for understanding cellular processes. Polymers at interfaces play an important role in (bio)technology, but a fundamental understanding of their interaction is still missing. We develop AFM-based methods to probe single polymer adhesion and friction at interfaces. As an example, we show that the contour length of single polymers and their monomeric desorption rate can be determined by a combination of constant-pulling-velocity and waiting-time experiments . In addition, the results from our single polymer friction experiments necessitate a new friction mechanism, which we term desorption stick . Surprisingly, this friction mechanism is largely independent of normal force, polymer length and velocity. These methods are now extended to probe the anchoring strength of cholesterol , peptides  or proteins in supported lipid bilayers. In addition, the molecular details of cohesion and friction in thin polymer films are investigated . Experiments of this kind will help in gaining a fundamental understanding of adhesion and friction properties of multicomponent systems.